Surfer, Whale Watcher, Nature, and Beach Lover’s Paradise. Yoga, bike, hike, enjoy farm to table restaurants. Browse art galleries or attend annual music, art and film festivals at the Pueblo Magico City of Todos Santos. View the stars or simply relax. Our condo building is the only 2 bedroom, 2 bath units in the entire Villas de Cerritos resort which allows one to enjoy amazing OCEAN, desert, and mountain views from your living room, dining, kitchen, master bedroom suite, and large private patio. Recently upgraded and remodeled, open-concept, 2nd story Condo with all the amenities of home. This condo boasts beautiful travertine tile flooring throughout and travertine bathrooms. This open-air unit is the perfect place for a vacation. BEDROOMS There are two suites. The Master has an attached full bath, lots of closet space, full size mirror, and private patio with ocean views. The Master offers a King size bed, a flat screen TV with DISH Satellite and DVD player. It offers luxury bedding, down comforters, down pillows, and towels. Suite Bedroom #2 has new beautiful King and XL twin beds. New luxury linens, down comforters, and down pillows. Large closets and sliding glass doors that lead to a small patio with peek a boo ocean and mountain views. There is a full bath next to 2nd bedroom. *Extra blow up twin mattress and sheets available if needed. The large kitchen is completely stocked, has granite countertops, stainless steel appliances and sink, a deluxe gas oven and stove and all the amenities of home. It has a bar with 4 stools. It is a wonderful place to cook a meal as you look out and enjoy the views of the ocean. The family room offers a large couch, love seat, glass dining table with seating for six, US DISH satellite and WIFI. It’s open concept layout, high ceilings and large sliding glass doors out to the private patio make you really experience indoor/outdoor ocean view living. The large, private patio boasts ocean, mountain, and desert views which can be accessed from the master suite sliding glass doors as well as from the family room sliding glass doors. The large patio offers 2 leather couches, coffee table, and table and chairs. 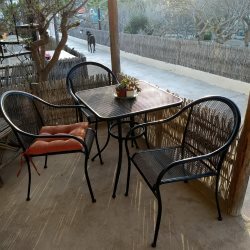 It’s a perfect place to relax, eat dinner, watch whales, enjoy the sunset and sunrise, or just enjoy the beautiful day. The guest bedroom offers a small patio with peek a boo ocean view. Both bedrooms have Air Conditioning. This unit has a fully stocked kitchen, WiFi in the unit as well as US Disk network. Large indoor / out door living space. New king size beds in both bedrooms. The 2nd bedroom has a Twin XL that can sleep one more person.